It is so easy for your inbox to become a confusing list of messages that you can hardly bear to face. Each morning there is another dozen or more messages freshly added to the inbox and if you don’t keep on top of them, you waste time and miss opportunities because you didn’t read a message or you read it and forgot to act on it. How do you bring order to a chaotic inbox? 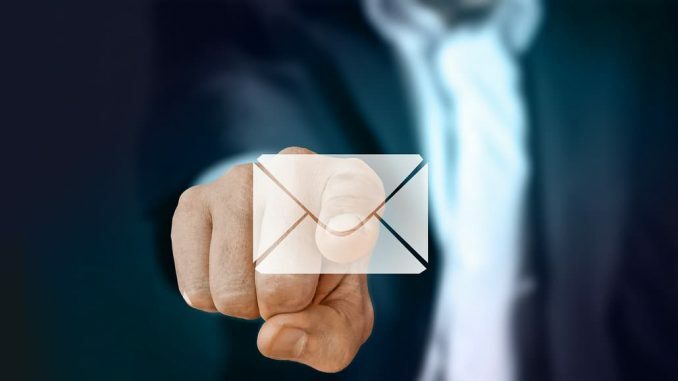 One way is by organizing emails into folders and Outlook provides some ready-made folders like the Inbox, Sent Items, and Junk Email, but they are not sufficient. By using folders to store different types of emails, you can cut down on the clutter in the inbox and more easily find important messages when you need them. Messages are less likely to be overlooked and forgotten with a bit of organization. There are probably other uses for the Archive and it is just a folder, but it is also a special folder because it is on many menus and buttons. Let’s take a look at how the Archive is used in Outlook. Outlook is both a desktop application and an online webmail service and here I will be looking at webmail running in a browser. The Outlook app is similar though, so what you learn here can be applied offline. Select an email in the inbox list and it can be moved to the Archive folder by clicking the Archive button in the menu bar or by clicking Move to and selecting Archive in the menu. Clear messages from the inbox to make it simpler and cleaner with less clutter. 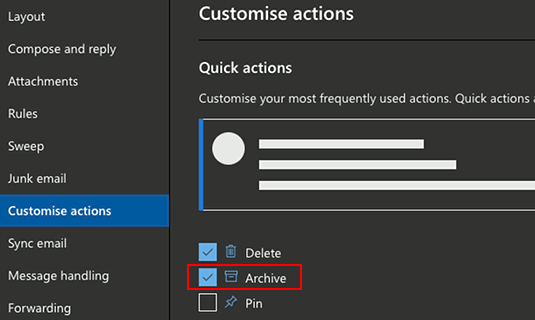 If you do not have an Archive folder, click New folder on the Move to menu and create it. To see the emails messages that have been archived, just select the folder in the left panel. 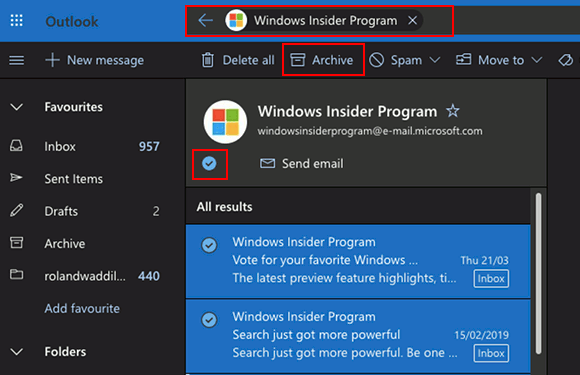 They are listed in the next column and selecting an email displays it in the preview pane. 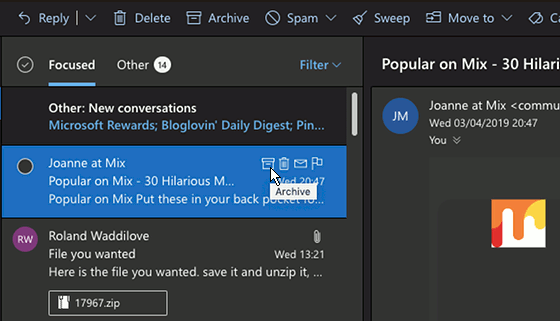 Emails can be dragged and dropped, so if you wanted to put an archived message back in the inbox, just click and drag it to the Inbox folder on the left. Messages can be dragged and dropped in other folders too. Up to four actions can be added to the email inbox listing and you may find it useful to set one to Archive. You may need to deselect one of the others if four are already set before Archive can be added. When the mouse hovers over an email in the inbox, icons appear at the right hand side. Click the Archive icon to move it to the Archive folder. 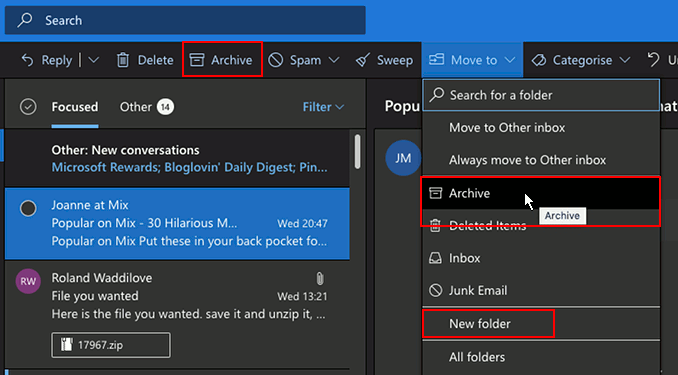 The icon saves you having to move between email and Archive button at the top repeatedly and you can simply browse the inbox archive appropriate items. Don’t you wish you had started archiving emails sooner? The box might have many messages that ought to be in the Archive folder and it would be tedious to have to go through hundreds or thousands of inbox messages manually archive them. Sweep them instead. Select an email in the inbox that you would like to move to the Archive folder. Click the Sweep button in the menu bar and there are several options. The first one moves all messages like this from the Inbox to wherever is specified next to Move to at the bottom. Select Archive and you can move all messages of this type to the Archive folder. The other options enable you to move all future messages to the archive or all but the latest message, or those older than 10 days. 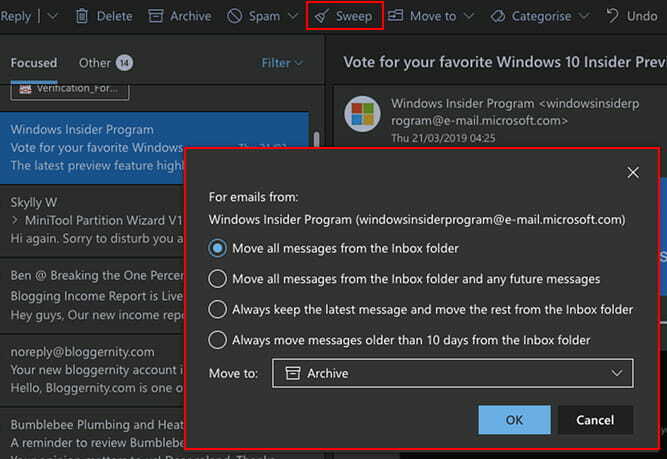 Using the Outlook Sweep tool you can clean up the inbox and move whole groups of messages to the Archive. Sweep the inbox clean. 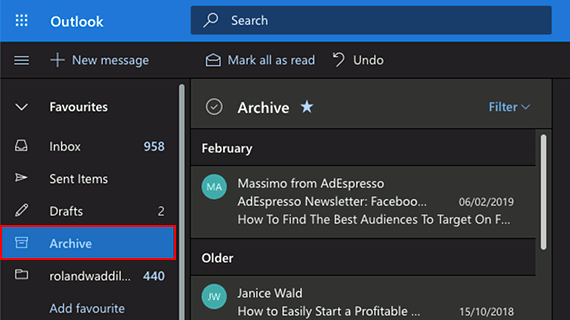 Another way to clean the inbox is to perform a search. This can be for a specific sender or a keyword or phase. After performing a search, tick the checkbox at the top to select all messages, then click Archive. If there are some search results you don’t want to archive, just deselect them before clicking Archive. Don’t let the Archive folder become a dumping ground for everything because it will be no better than the Inbox. Use it for a specific type of email.